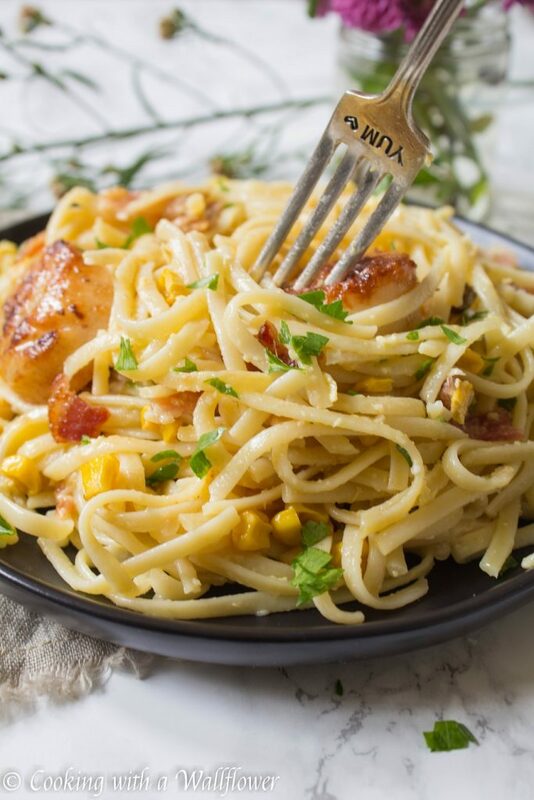 Creamy pasta carbonara topped with pan seared scallops and roasted corn. 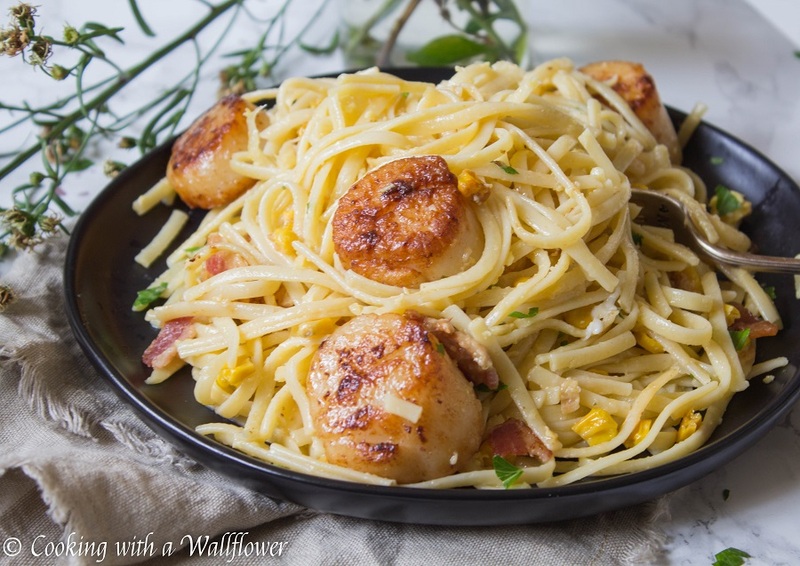 This pan seared scallops pasta carbonara is a twist to the classic favorite. It’s finally fall! And I’m more than a little excited for the start of the season. Why? Because fall is my favorite time of the year. I mean, how can you resist the colors of the leaves as they change into vibrant colors? Or the variety of apples available for apple pies, apple tarts, apple cider, apple cider donuts?! Or if you’re a fan of pumpkin, PSL? Or pumpkin pie? And let’s not forget all that comfort food. I’m actually celebrating fall this weekend by visiting wine country. Since we don’t really have much of a fall in San Francisco, I have to go outside the city to find the vibrant colors of fall. Wine country offers the changes in the colors of the vines. And I’m excited to get away from the city for even just a day. But, let’s talk about comfort food. Pasta carbonara is one of the simplest comfort foods. I mean, seriously, pasta, eggs, parmesan cheese, bacon? It’s what I need in my life every night for dinner. 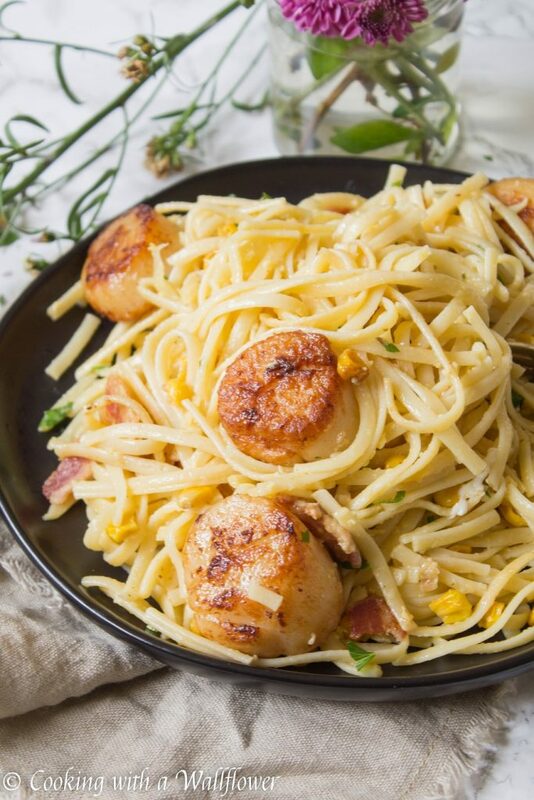 And then you can take this classic pasta to the next level by adding pan seared scallops and roasted corn. 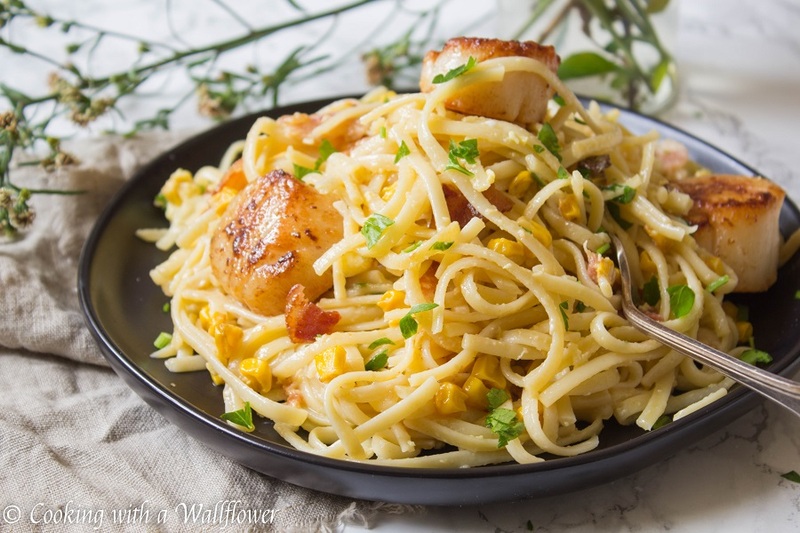 Caramelized scallops and roasted corn tossed with creamy pasta carbonara. This dish is definitely something I could eat every single night and not get tired of. It’s easy enough that you can make it for a weeknight dinner. But with the addition of pan seared scallops, you can also turn this pasta into a dish fit for a small dinner party with family or friends. You can find the full recipe to this Pan Seared Scallops Pasta Carbonara over at Ask Anna where I contribute a post every month. This entry was posted in Entree, Pasta, Quick and Easy, Recipes and tagged comfort food, entree, Pasta, quick and easy, scallops. Adding scallops to one of my all time favorites – love it! 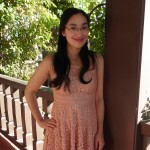 Andrea, I read the full recipe on Ask Anna. I love scallops so I will try this.